Michael Booth was crowned Aussie Marathon Champion for the third consecutive time on Tuesday afternoon with epic 18-20 knot southerly conditions treating the competitors to a prodigious downwind battle. Booth expressed that despite the disappointment on day one, he was pleased with how he raced overall. Tuesday’s distance race begun at Rainbow Bay paddling downwind towards Bilinga Beach for 3.5km before turning to paddle into it to Snapper Rocks and finishing outside Currumbin RSL. Boothy looked strong in the distance race – pushing the pace right the way through and keeping the pack on his tail working hard. 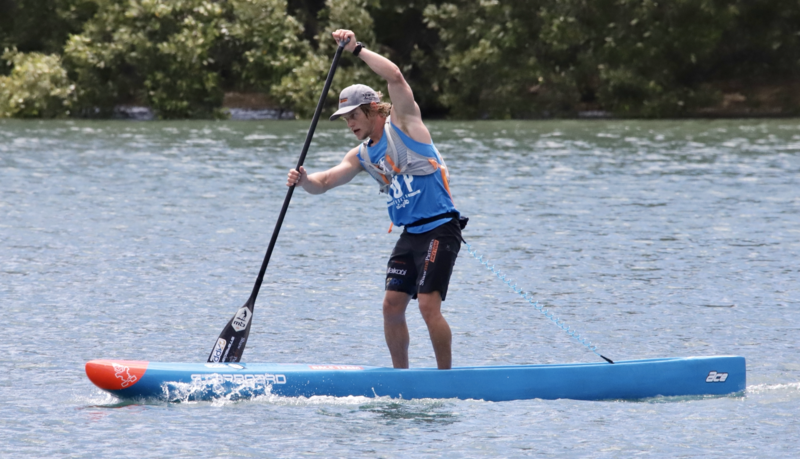 Whilst Michael was only competing against fellow Aussie contestants, Titouan Puyo from New Caledonia competed on the Gold Coast and pushed the pace with Boothy. “Tituon and I were able to get out in front early on and it was basically a match race from the word go. “We pulled away from the pack early and by the finish, we had a decent gap on the remainder of the field. Tituon finished the race in first place after breaking away from Boothy in the final home stretch at Currumbin creek. “It was great to have Tituon pushing the pace with me, he definitely kept me grinding the whole way and I have no doubt my finishing time was a result of having someone to push myself against for the whole course,” said Booth. Michael finished ahead of Aussie team mates James Casey, Ty Judson and Lincoln Dews. “It feels fantastic to take out my third Australian Title.